Looking to add links or change elements on your Standard Lead Page? This is the spot. Here you'll find answers to customizing images, links, adding multiple forms to a page and more. PLEASE NOTE: We cannot support the use of these services, but if you'd like to give them a try we welcome you to do so! Once you've customized your image, you can re-upload your image to your Leadpages account and use them with your pages and pop-ups. For more information on how to add and remove images from Leadpages take a look here. Paste your URL and press Done. Make sure to Save your page. Use this when you want to drive traffic to two or more different lists and/or integrations from the same Lead Page. Visitors will have the ability to opt in to multiple/different events, time slots, or Email Service Provider integrations, depending on which button they click. For example, in the Lead Page below, each “Click Here to Claim...,” box is linked to a different integration setting/list. This means that you can segment your audience right from the point of opt-in, providing different thank you pages, and/or follow-up sequences. Select Link Options, then click Show Opt-in Form. Select Advanced settings, then click +CREATE ANOTHER OPT-IN FORM. Click VIEW/EDIT to start editing your new form. Any pop-ups (i.e. opt-in forms) that exist on your page but aren’t mapped to a call to action button are “orphaned pop-ups” and will be deleted when your Lead Page is saved. Pop-ups created in a given Lead Page are only available in that Lead Page, and not available under the Conversion Tools main menu. 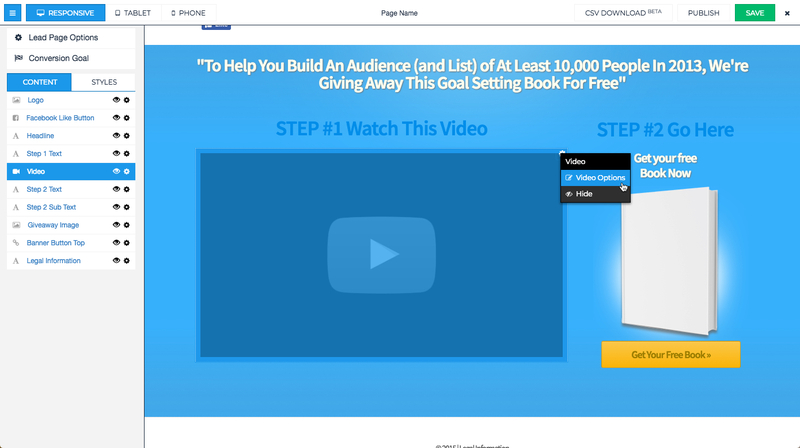 The opt-ins for all pop-ups on a given Lead Page will be counted toward the same analytics. 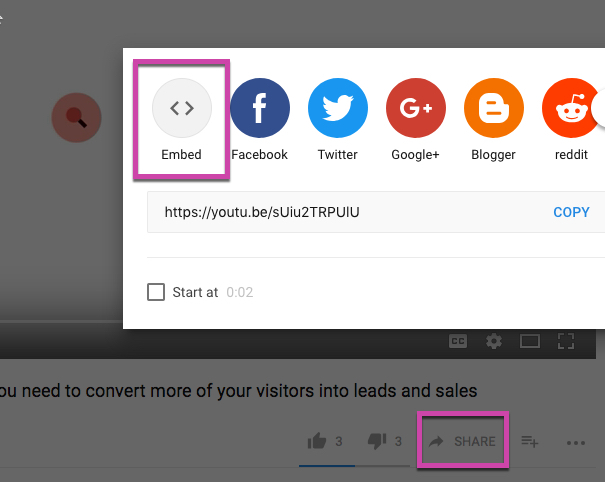 NOTE: Standard Builder templates are static and therefore, there is not a way to add a video to a page that does not yet have a video element on the page. Hover over the video element of your page, then click the gear icon in the top right corner of the element. Select Video Options, then paste your iframe code. Click Done and make sure to Save your page at the top right corner of the builder. After adding my video’s embed code, the buttons and other content under my video stopped working! What happened? Certain embed codes sometimes extend an invisible frame beneath the video which tends to overlay the elements beneath the video, such as buttons and hyperlinks. This can be resolved by removing any parts of your video embed code outside of the <iframe> and </iframe> tags. If your video embed code does not contain these tags, we recommend that you reach out to your video host to find out how to get iframe embed code for your video. This issue occurs most often with Wistia’s non-iframe video embed code. For information on generating iframe code through Wistia, please see this article from their Help Center. Why can’t my Vimeo videos be seen by some visitors? Your video’s privacy settings may be too restrictive, or you may have domain-level privacy enabled on your video. We advise reaching out to Vimeo for assistance with this if the linked articles don't help.